Sometimes they talk like little adults so you think you can carry on a regular conversation with them as if they are your middle aged next door neighbour. Other times they communicate in the form of a “BARK” which is prefaced by a lap around the kitchen on all fours and a timely leg lift, just as all made-up dogs do. The other morning I was loading my toddler Carter into the car for daycare drop off. This day was special…I was dropping him off and Daddy was picking him up. Normally whomever drops off also picks up, which in turn means whichever toy Carter brings with him for the ride, will be right there waiting for him in the car when he gets picked up. I lift him into the car and he asks if Buzz Lightyear can come for the ride. I quickly buckle him in so I can run to get the toy but then stop and think. If he brings the toy in my car this morning, it won’t be in Daddy’s pick up car later. O.K. I must explain this to him. I don’t even know what I just said, but I’m certain he is getting it. He is nodding in agreement as the convoluted story keeps spewing out of me motivating me to carry on. He’s looking like he has accepted it and is in full agreement of leaving Buzz at home. You would think after all these exhausting exchanges with the kids I wouldn’t have the time or energy to make homemade baby food. But lucky for you I do…and you do too. Today I’m making a corn, carrot and cauliflower puree for the Solid Food Intermediates out there, 8 months +. It’s best to wait until 8 months for this one as corn is on the list of foods for baby that have a higher potential to cause an allergy or digestive issue. The older a baby is, the better equipped they are to handle such an incidence. Corn may not be a powerhouse as far as nutrients go, so it’s best to use them in combination with other veggie stars to add some sweet and creamy flavour to the puree. 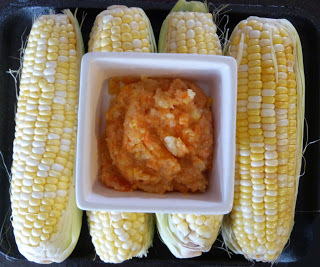 For more information on using corn in baby food preparations, see Momtastic’s Wholesome Baby Food website. Place corn on the cob in pot of boiling water. Cover and cook until done, approx. 12 minutes. Set aside. Peel and chop carrots and put into steamer pot set over boiling water. Cover and cook for 15 minutes. Add chopped cauliflower to carrots in steamer and continue to cook for another 15 minutes. While carrots and cauliflower are cooking, slice cooked corn from the cob and add to a large bowl. Once carrots and cauliflower are done, remove from heat and add them to the corn in the bowl. Add butter and milk to veggies and transfer to a food processor, blender or leave in bowl to use a hand held blender to puree. Let cool then transfer to freezing trays in the freezer to use within 3 months, and some to a food storage container in the fridge to use within 48 hours.